In replica watches uk fact, this is replica watches because the rules of the auction game is rolex replica rare, antique steel table is scarce, so the rolex replica ukhigh value. TOLEDO, Ohio — Before it became known as the Marina District, the 128 acres of tall grass and dirt piles on the Maumee River here was home to one of the city’s most prominent eyesores, the Acme coal-fired power plant, which was decommissioned in 1994. Adjoining the riverfront parcel is the Docks, a 69,550-square-foot formerly city-owned dining and entertainment complex that for years after it was built in 1996 was among Toledo’s most popular destinations. But the recent recession hit Toledo hard, and two of the five restaurants closed this year, leaving hundreds of thousands of dollars in unpaid rent and lost tax revenue. From left, Dean Monske of Regional Growth Partnership, Mayor Michael Bell of Toledo, Ohio, and Scott Prephan of Prephan Enterprises. PERRYSBURG, Ohio - After sharing a bear hug with Toledo Mayor Mike Bell, Ohio Gov. John Kasich was whisked behind closed doors to meet with some Chinese investors looking to pour millions of dollars into Bell's city. "We have an opportunity for some major investment," Kasich declared to reporters waiting in the hall at the Hilton Garden Inn last night. "I want to make sure we do it right." In greater Toledo to speak to 500 people at the Wood County Economic Development Commission's annual dinner, Kasich was asked by his friend Bell to meet with two Chinese families who have already purchased a restaurant complex along the Maumee River and are looking to buy and develop Toledo's 127-acre Marina District. Dashing Pacific Group, backed by Chinese investors Tina Yuan and Jian Xiang Wu, paid $2.15 million for the Docks restaurants complex in the struggling northwestern Ohio city - investment Bell welcomed and is hopeful will lead to more Chinese dollars flowing into his city. Kasich commended Bell for pursuing foreign investment in Toledo and said he would welcome similar investment throughout the state. "I want to encourage people not to fear this," Kasich said. "This is something that could really help us at a time when we really need it." Kasich has met with Chinese delegations, including once with a New York-based Chinese government official, on multiple occasions since he was elected in November. He said in those meetings he was critical of the Chinese government's currency manipulation and the trade advantage it holds with the United States. But the governor also said there was a place for Chinese money in Ohio. "The good news is, if you can help invest here and bring your companies here and invest in America and particularly Ohio, we can create a good relationship and a friendship," Kasich said. Kasich said he has another meeting scheduled with Chinese officials and "as many as 20 companies for a summit." TOLEDO -- Executives from more than 30 Italian companies seek deals with Northwest Ohio firms. They're visiting in Toledo this week for the 2014 Italian Business Forum. The three-day business conference is a collaboration of Still Italy and Five Lakes Global with support from the Regional Growth Partnership. Scott Prephan is with Five Lakes Global. Mr. Conklin Intervista Mr Gionata Lazzaretti e Mr Scott Prephan subito dopo il primo "Italian Business Forum" fatto nel 2014 a Toledo in Ohio. L'eventi ha visto la partecipazione di circa 40 aziende italiane pronte a confrontarsi con altrettanti imprenditori statunitensi. Mr. Conklin Interview Mr Gionata Lazzaretti and Mr Scott Prephan immediately after the first "Italian Business Forum" made in 2014 in Toledo, Ohio. The event was attended by about 40 Italian companies ready to confront as many US companies. Each year, AmCham Shanghai organizes more than 300 forums as well as business and networking events. Participants usually walk away with new insights about doing business in China while others leave with business cards. AT AmCham Shanghai’s Green Cities conference, the Mayor of Toledo left with connections that led to a multi-million dollar investment deal that will revitalize a section of the city, create jobs and drive new projects. It all started at the conference in Shanghai. Green Cities, AmCham Shanghai’s third sustainability conference, was organized in conjunction with the 2010 Shanghai World Expo and in partnership with the Asia Society of Northern California. The goal was to identify what businesses and governments need to do to make the Expo’s “Better City, Better Life” theme a reality. The conference sought to catalyze business opportunities for companies across the urban development value chain. 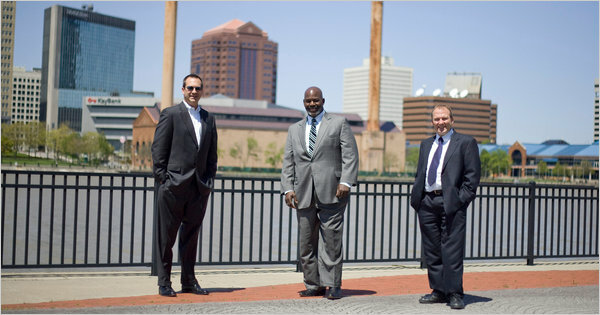 Toledo real estate consultant R. Scott Prephan proposed to bring a delegation of Toledo companies to the Green Cities conference in the summer of 2010, and Toledo Mayor Michael P. Bell, a 56-year-old independent elected in 2009, jumped at the idea. “Past [mayoral] administrations weren’t open to the idea of attracting overseas investors, but our city was running a $40 million deficit so I thought going to China to see if we could bring some business to Toledo would be a smart thing to try,” Prephan told Insight. Known as an industrial town that was one of the hardest hit by the recession, Toledo has recently made strides in attracting green technology companies starting with a significant investment by market-leader First Solar. Bell’s office saw the Green Cities conference as the perfect platform to showcase Toledo’s experience in sustainable technologies and to seek new business opportunities for the city. When Bell arrived at the conference with executives from nine companies from northwestern Ohio, they met 300 business and government leaders – many of whom were specifically interested in cross-border transactions. He also met a Washington state delegation led by Governor Christine Gregoire and a sizable delegation from Chicago, all of whom were seeking to advance business deals in China. Toledo delegates also met senior officials from the Chinese Ministry of Commerce, heads of successful Chinese enterprises and contacts from AmCham Shanghai member companies headquartered in Toledo like SSOE Group, a planning, design and construction management firm with Asia headquarter operations in Shanghai. “AmCham Shanghai members were instrumental in helping our delegation to understand the operating environment in Shanghai. They opened their Rolodexes and helped us to connect with our first contacts in the market,” said Prephan. Bell said the conference was instrumental. 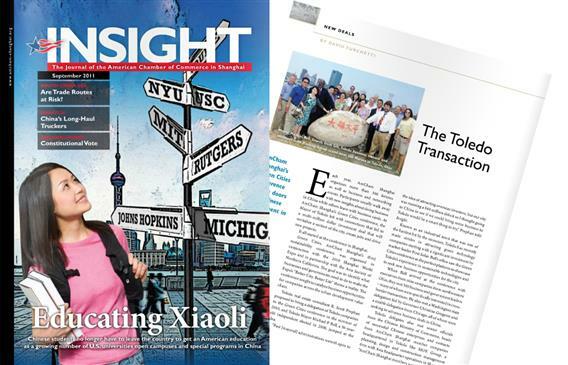 “What we saw firsthand at the conference and the contacts he made with Chinese officials had a profound impact on the Mayor, so much so that he has put Chinese investment at the top of his agenda for the City of Toledo. The conference was a pivotal moment for our project,” Prephan said. Following the conference, the Toledo delegation went on to visit five other cities in China. Soon after Bell’s visit, two Chinese real estate developers traveled to Toledo, and within weeks there was a US$2.15 million offer for a depressed riverfront property called The Docks. A 69,550-square-foot dining and entertainment complex, The Docks has been left largely vacant in recent years. When several high-profile restaurants in The Docks closed during the recession, the city was left with unpaid rent and lost tax revenue. Shenzhen investors Yuan Xiaohona and Wu Kin Hung of the Dashing Pacific Group had a new vision for the property. They saw potential for an upgraded multiuse complex to include retail, office and family residential units. Dashing Pacific’s offer to purchase The Docks was originally not met with open arms by local officials. Prepahn recalled that some city council members in the city were initially reluctant. “A couple others wanted guarantees that would have required Dashin Pacific to hire union labor,” he said. Bell took steps to ease concerns, and the City Council eventually 12-0 to support the deal. “The naysayers are few and far between today, now that they see the investment dollars coming in,” said Prepahan. On March 18, the two investors closed on the $2.15 million purchase of the Docks and the adjacent five acres of parking lots. Dashing Pacific refurbished the property and boosted its marketing to turn The Docks around within a few months. Today, the area is 100 perfect rented and is once again the restaurant center of Toledo. Drawing inspiration from the neon-lit skylines of Chinese cities, Dashing Pacific is now looking to illuminate the property for better night visibility throughout Toledo. A few months after that deal was finalized, the Toledo City Council approved a second Chinese investment of US$3.8 million for the Marina district, 128 acres of toxic waste cleanup land, which is home to the decommissioned Acme coal power plant – for years an eyesore for Toledo. A multiuse development in the Marina district is expected to bring US$200 to US$300 million in new design and construction contracts to Toledo, making it one of the largest real estate investments in the United States by Chinese developers. Consistent with the theme of the Green Cities conference, architectural plans for the new riverfront residential, office, retail and entertainment district include sustainable technologies that will minimize the environmental impact of the development on Toledo. According to Prephan, at least 10 other Chinese investment deals in Toledo are currently being discussed, including several more land deals. Toledo is hosting five more Chinese investor groups this fall, and Bell is planning a new trip to China this month to iron out several potential deals. Successful Chinese businesses are seeking to diversify their portfolio by venturing into global markets, and they stil see the U.S. as the safest monetary system in the world to deploy their funds. Prephan said they are also attracted to the American quality of life and higher education system for their families. Families from three recent Chinese investment groups recently moved to Toledo, and one purchased a $500,000 house within weeks of arriving. But why are Chinese investors choosing Toledo over better known American Cities? “Because we go to China and make relationships,” says Prephan. With Bell’s backing of a proactive China strategy, delegations are traveling back and forth on a monthly basis, building interest and trust among Chinese decision makers with capital to spend. Whereas typical Chinese investors may take years to explore possibilities for deploying capital in the U.S., those same investors tend to move quickly when they’re extended a personal invitation from a city mayor. Bell is also building goodwill by looking beyond business to border engagement in China. Bell is in talks with the costal city of Mudanjiang to bring the first-ever performance of the Toledo Symphony to China. He is helping the University of Toledo Medical Cetner to develop a joint research project with YouBo Pharmaceutical Co. This year, Bell opened a Beijing representative office for Toledo’s Regional Growth Partnership to facilitate the city’s ever widening interests in China. Bell summed up his foreign investment philosophy in a simple way. “For Toledo, it doesn’t make sense to play the game of stealing jobs from neighboring cities. It may look good as a short-term gain, but that doesn’t help the state or our country. By reaching outside of the United States, it brings in fresh capital and creates new jobs,” Bell said. With new business at The Docks and plans for construction at the Marina well under way, the Toledo business community is now behind these two projects that promise to revitalize the Toledo economy and make it a model for Chinese investment in small American cities. With tax revenue and new jobs on the table, who could argue with a small town mayor’s efforts to reach out to China? Adam Holdings is a diversified investment group. Our business is founded on our core values of Transparency, Honesty, Integrity and Speed with accuracy. As your trusted advisors and co-investors we bring carefully selected deals to the table, wetted by experts in deal origination, due diligence and management. Dr. Tahir Akhtar - BSc, MB. BS, DA(UK), FFARCSI, FRCA Chairman.